As Cargo scales across the U.S., SnackNation will provide data and guidance to help Cargo predict and source products that fit into a regional and seasonal merchandising strategy tailored to a diverse national rider base. Recently Named Best Food Box by The Subscription Trade Association, SnackNation’s Los Angeles Cargo launch selection includes Halfpops Simply Sea Salt Curiously Crunchy Popcorn, Nothing But The Fruit’s Raspberry Chia Real Fruit Bites, and Yomms Coco Twist Deli Nuts. By opening the Snapchat app and scanning the Snapcode printed on the Cargo box, L.A. riders have a familiar way to more easily browse and select products available during their ride. While browsing Cargo’s menu, riders can also unlock Snapchat Lenses from Cargo brands. Cargo is the only scalable, data-driven in-car solution for reaching Millennial and Generation Z audiences who avidly use Uber and other rideshare services. Cargo is available in New York, Boston, Chicago, Minneapolis, Washington, D.C., Baltimore, Atlanta and Dallas. SnackNation curates and delivers great tasting, better-for-you snacks to more than half a million people in thousands of member offices and homes nationwide. SnackNation is a tech-enabled snack delivery service that serves today’s most innovative, best-tasting, and emerging CPG brands to high value consumers at their most engaged moments. SnackNation exists to inspire more conscious food decisions. Founded in 2014, the company curates and delivers great tasting, better-for-you snacks to half a million people in thousands of member offices nationwide- places like Microsoft, MailChimp, Soothe, and many more. SnackNation is committed to fighting hunger outside the office too. Last year the company donated more than a million meals to families in need through its partnership with Feeding America and is on track to donate two million more by the end of 2018. To learn more, visit SnackNation.com. 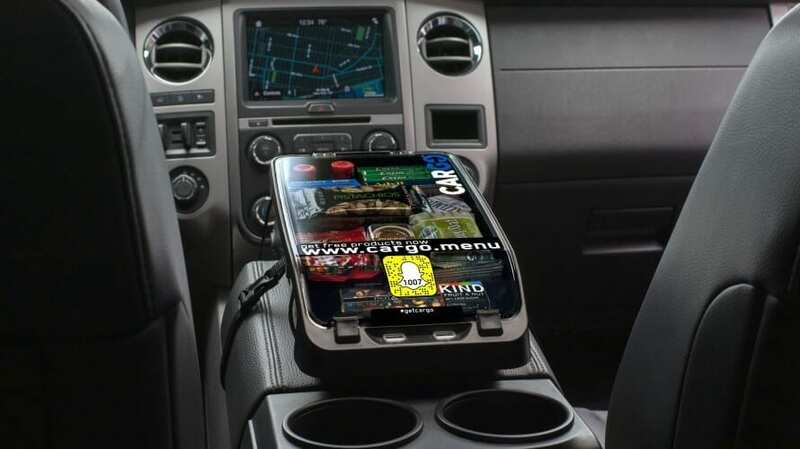 Cargo is the leading provider of in-car goods and services for the rideshare economy. With access to Uber’s API, Cargo’s in-car commerce platform enables passengers to use a smartphone browser to buy from a curated mix of snacks, gum, premium electronics, cosmetics, and personal care items while in transit. Visit www.getcargo.today for more information and follow Cargo on Facebook and Twitter. -Passengers visit Cargo’s mobile menu (www.cargo.menu) on their smartphones and enter their driver’s unique box code on the Cargo display box. -They then select their desired product from the menu. -If the product is free, they simply hit the check-out button. If the product is for purchase, they can pay with their preferred mobile wallet or credit card. -Once the vehicle is stopped, the driver gives the passenger the drink from the Cargo display box. Snapchat app by scanning the Snapcode printed on the box.